Despite the fact that there are about 5000 living species, with several times that number of fossil species, the Bryozoa remain largely unknown to most people. Bryozoans, or "moss animals," are aquatic organisms, living for the most part in colonies of interconnected individuals. A few to many millions of these individuals may form one colony. Some bryozoans encrust rocky surfaces, shells, or algae. 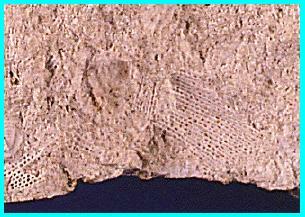 Others, like the fossil bryozoans shown here, form lacy or fan-like colonies that in some regions may form an abundant component of limestones. Bryozoan colonies range from millimeters to meters in size, but the individuals that make up the colonies are rarely larger than a millimeter. Colonies may be mistaken for hydroids , corals , or even seaweeds . Bryozoans are considered nuisances by some: over 125 species are known to grow on the bottoms of ships, causing drag and reducing the efficiency and maneuverability of the fouled ships. Bryozoans may also foul pilings, piers, and docks. Certain freshwater species occasionally form great jellylike colonies so huge they clog public or industrial water intakes. Yet bryozoans produce a remarkable variety of chemical compounds, some of which may find uses in medicine. One compound produced by a common marine bryozoan, the drug bryostatin 1, is currently under serious testing as an anti-cancer drug. Click on the buttons below to find out more about the Bryozoa. Find more bryozoan links at the Bryozoa page of the Zoological Record . Get the latest on bryostatin from the clinical trials information page of the International Cancer Information Center .